Late blight, caused by Phytophthora infestans, is a serious disease affecting mainly tomato and potato throughout the world. It is a common disease in New State and the surrounding states in the Northeast since our summer, with cool temperatures and frequent rains, is very conducive for disease development. Late blight is such a serious problem because the inoculum (spores) is easily carried in wind currents to infect susceptible plants in even the most remote area in our region. 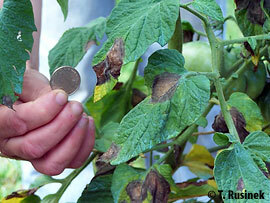 Currently all tomato and potato plants grown in home gardens and in commercial fields are susceptible to late blight! Commercially growers have to respond to reports of the disease by spraying fungicides to prevent spread of the disease, which otherwise would mean certain death of their crops. Unfortunately, homeowners may not be as aware of this important disease, and if no corrective actions are taken in a timely manner, home gardens can provide a source of inoculum for neighbors and for commercial interests. The occurrence of late blight in 2009 is different compared to most seasons in two ways. First, this is the earliest the disease has been reported over such a broad region of the country. Several years ago we had a similar occurrence with the disease originating from one county source in upstate New York. 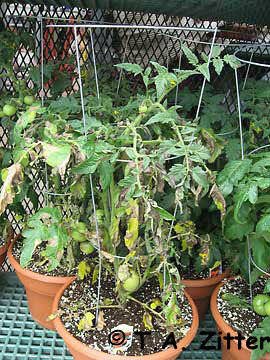 By the end of the summer disease had spread to at least 14 counties, destroying tomatoes in the entire region. The second reason, and more tragic for the Northeast, is that infected plants were distributed to large local retail stores throughout the region (Ohio to Maine). Never before has such an extensive distribution of infected plants occurred. The inoculum is exceptionally contagious, spreading on garden center shelves to tomato plants not involved in the original and initial source of the inoculum. We have spread the word of this impending disaster, and within a day the original supplier, working with Department of Agriculture in the affected states, has removed most of the initial source plants. In checking to make sure that these plants had been removed, I found local stores in Ithaca (Tompkins Co.) had removed almost all of supplier’s plants on Saturday, June 27. 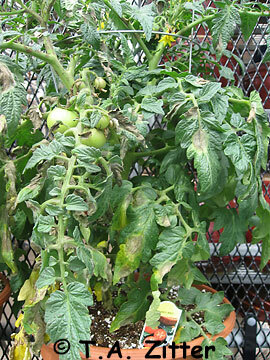 However, the disease had already spread to other tomato plants not from the original source. I stopped several people from purchasing infected tomato plants while I made my visits, and I was very pleased that the garden center managers immediately removing the remaining tomato plants from their shelves. But I know that this same event is being repeated in multiple garden centers around the region. What to do now? Many families have taking up vegetable gardening, given the tough economic times, and tomato is the most important crop in gardens. The good news is that in checking with local small garden centers in Tompkins County, I found no evidence of late blight. The organism is not seedborne (however, it is tuberborne in potato), so that tomato plants started from seed locally would be free of the disease, at least for now. Given the scenario that I described, we must assume that many infected tomato plants have been planted across the entire region, if they originated from so called “big box” stores. Identification: The symptoms that develop on tomato leaves, stems and fruit are quite dramatic, and are very obvious to the naked eye. The leaf lesions are water-soaked, varying in size from a nickel up to a quarter. They are water-soaked when the foliage has been exposed to watering or heavy overnight dews. When these lesions drying out quickly, they may appear lime-green in colored or even become beige. Please refer to this web site for illustrations (http://vegetablemdonline.ppath.cornell.edu/DiagnosticKeys/TomLeaf/Late_Tom.htm). The edge of the water-soaked lesion, on either the top or bottom leaf surface, will be covered with white fungal growth that contains the spore inoculum (visible with a hand lens). Spores are easily blown to surrounding areas and infect plants and even weed species, in the family Solanaceae (the black nightshade family). If the lesion has a yellow border and is occurring on the bottom of the plant, it is likely due to infection of either early blight or Septoria leaf spot, two common diseases found in home gardens. Again check the Veg MD web site to aid in diagnosis. Brown to almost black lesions appear on infected stems, and the same lesions will develop on fruit, either directly on the infected plants, or a few days after they are sitting on your kitchen counters. Although it is not dangers to humans, most of the fruit could be used if the affected area is removed. 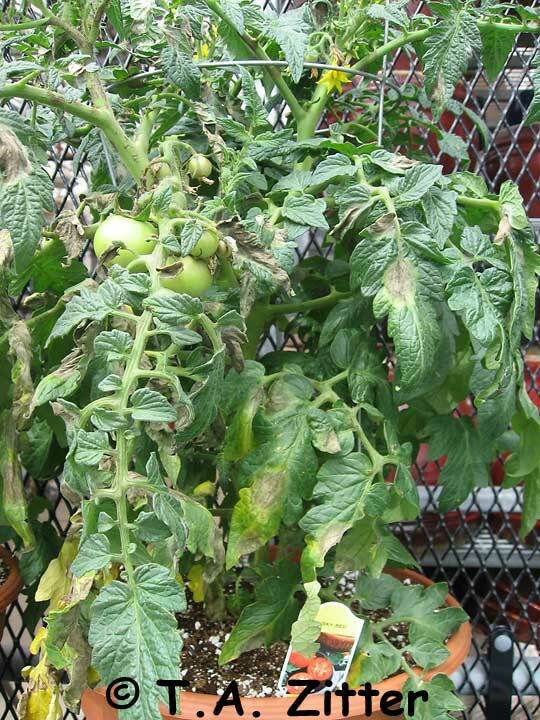 Plant examination and removal: Please inspect your tomato plants on a daily basis! If symptoms are already appearing on plants in your garden, these plants should be removed and put in a plastic bag for disposal. Don’t just put the removed plants in a compost pile as spores will still spread from this debris. Your neighbors, not to mention commercial growers, will appreciate your taking this action immediately. Plant treatments: Commercial growers have a number of fungicides that if applied early and often, can reduce the spread of Late Blight. They would choose not to spray if they could, but this destructive disease does not give them any other option. Homeowners do have a few products that are registered for use and the common name of chlorothalonil should appear on the product label. Even here, these products are only effective if used before the disease appears and should be reapplied every 5-7 days if wet weather persists. Chlorothalonil is a protectant fungicide, with no systemic movement in the plant, so thorough coverage is necessary. For organic growers and homeowners, the options are very limited, since only copper fungicides can be used, and they are not very effective. Late blight on tomatoes found for sale at local store. Click on images for enlargements.